By Patty C. Rice, Ph.D. 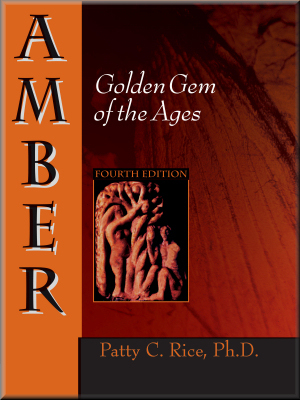 This book describes the Baltic amber industry which has utilized amber as a gem stone throughout the ages. It also describes a variety of fossil resins, their characteristic and locations. It includes the most recent research and directs other researchers to sources such the Internet and publications. The mining of amber in Kaliningrad and Gdansk hydraulic extraction are featured in a photo-documentation format. This feature is very unique. The book also includes photos of mines dug in Bayaguana and Santiago, Dominican Republic. It includes illustration and descriptions of outstanding amber artists as well as the leading scientists studying amber as a fossil resin. The description of the Amber Room and its restoration that opened to the public in May 2003 is current and unique. The original version of this book was considered a definitive work-- a reference for other amber researchers and scientists. In the late 1980s modern scientific equipment revolutionized the thinking about amber. The fossil insects were studied to reveal information about evolution of the fauna and flora of prehistoric times. The Fourth Edition includes descriptions of work of David Grimaldi, Rob DeSalle, George Poinar, and Raul Cano, pioneers in DNA research from amber fossils. George Poinar donated photographs of many of his discoveries of first published representatives of various classes of insects and parasites. This book includes something for everyone studying amber from a variety of points of view. Even archaeological finds and mythological information gives amber a humanistic side since amber was used by primitive people in many cultures. Bottom line, this is a new updated edition of the classic version. The old classic version was just about impossible to get (unless one was willing to spend exorbitant prices on the market) that the public outcry forced the 4th edition to be published in the fall of 2006.